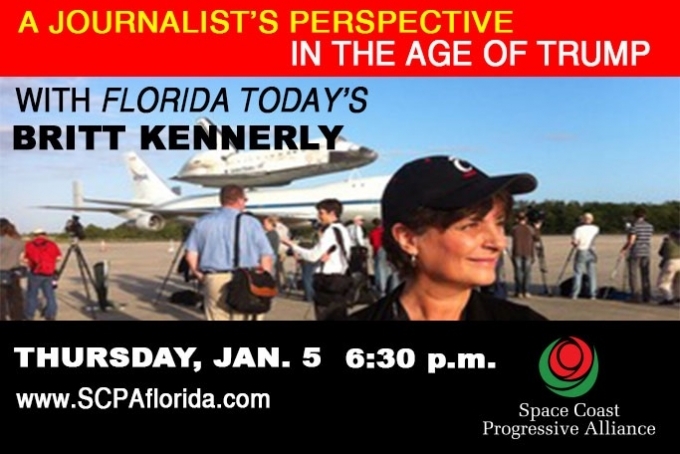 One of Florida Today's leading journalists explores news, newspapers, and the meaning of truth. Thursday, January 5, 2017, at 6:30 p.m., join us for a presentation discussing the struggle, and future of, newspapers and news outreach to the public, media impact on elections, the emergence of "fake news" sites, and the value of trustworthy reporting -- all happening in the "age of Trump." This event is free, and open to the public. Please bring a friend to the Front St. Civic Center, 2205 Front St., Melbourne, FL 32901. Britt Kennerly is the deputy public opinion editor-columnist for FLORIDA TODAY, a publication that has been serving the daily news and information needs of Brevard County for over 49 years. A self-avowed pop culture fan, news junkie and storyteller, Britt's career has spanned decades in the journalism industry. Over time she has witnessed the digital evolution in the news business and the shift from print to online publication. New technology has opened the door to public input and interaction and actually seeing what people are thinking about. Britt will tell you that 'quality matters' and it's both a responsibility and an honor to represent the paper and the trust of the people who tell their story.